as well as Eqs. (6.38) to (6.41). Sn and Xn can be calculated by coupling the n substrate balances. The most important property of such a system is the step by step decrease in substrate concentration and increase in bacterial concentration it exibits. 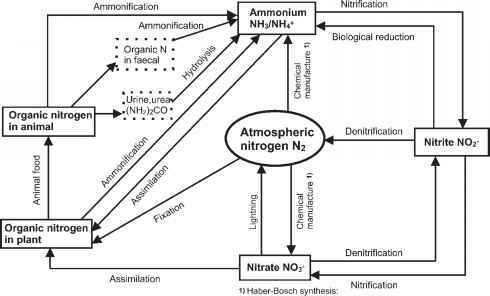 For certain conditions of influent substrate concentration and kinetic coefficients, the n-stage cascade is characterized by a higher total reaction rate, compared to a CSTR. Let us discuss the behavior of a cascade with two stages, without presenting a special figure, but looking at Fig. 6.6 showing a somewhat higher difference because of its plug flow characteristic (infinite number of stages). If S is relative high, e.g. for low mean retention times tR, substrate concentrations S are equivalent in both systems showing nearly the same low removal efficiency because of the zero-order region of Monod kinetics. But for low S values and/or higher tRx, the two-stage cascade shows remarkably lower S as a result of the first-order region. In other words: a substrate removal from 5000 mg L-1 COD down to 500 mg L-1 COD is performed as a reaction with nearly zero order (for KS = 100 mg L-1 COD); and a two-stage cascade is not advantageous. A substrate removal from 100 mg L-1 COD to 10 mg L-1 COD, however, takes place in the region of the first-order reaction with a remarkably higher reaction rate in a cascade of two or more stages! The influent substrate concentration is 500 mg L-1 COD. Here, the region of Monod kinetics is effective, starting from nearly zero order down to a first-order reaction. For nR = 0 (no bacterial recycle), tRC is infinitely large: for all mean retention times tR bacteria are washed out (Fan et al. 1970; Sundstrom and Klei 1979). This property differentiates the cascade with recycle from a chemostat or a cascade system without sludge recycle. In both systems (one stage = chemostat; and n stages = cascade) washing-out situations can occur. With increasing number of stages tRC increases starting from the lowest value for n = 1 (chemostat) to the highest value for n = ^ (plug flow reactor).